We have openings for the current school year. To find out more information or to schedule a tour contact Mrs. Becky Ward at bward@stpeterrockets.org. Registrations for the following school year begin in January. Through the generosity and support of our families, St. Peter School is blessed to offer financial assistance to those families having unexpected financial difficulty or might not otherwise be able to enroll at our school. This program is strictly confidential and based on actual income and family funding. Our school has a major fundraiser to help grow the Guardian Angel Fund. If you are blessed financially please consider making a donation to our fund making it possible for other less fortunate students can receive a Catholic education. Please contact the school office if would like more information on the assistance offered through the Guardian Angel Fund. If you will be paying your tuition in full for the school year, the deadline is August 1st and must include all registration and technology fees. The Smart Tuition fee will be waived for families who pay in full. ​All families are expected to register with Smart Tuition. There are multiple payment plan options for tuition and other fees for field trips, pizza lunch, etc. will be assessed monthly Enrollment instructions are included at the bottom. Through the generosity and support of our families, St. Peter School is blessed to offer financial assistance to those families having unexpected financial difficulty or might not otherwise be able to enroll at our school. This program is strictly confidential and based on actual income and family funding. Please contact the school office for more information on the assistance offered through the Guardian Angel Fund. Our Before and After School program ("BASE") is a nurturing enhanced environment and is open to any student currently enrolled at St. Peter Catholic School PK-8th grade. Students have the opportunity to do homework, play games, work in the technology lab, and enjoy the outdoors at St. Peter. BASE is open from 6:45AM to 8:10AM and 3PM to 6PM on all days that school is in session. All students must be signed out by the adult picking them up. The time must also be recorded. There is a late pick-up fee for children picked up after 6:00 PM. The fee is $1.00 per minute. There is no BASE Program on days when the school is closed. Short sleeves shirts should extend at least halfway to the elbow. Logos are not allowed, except for the St. Peter School logo. 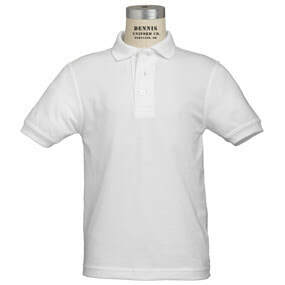 Undergarments worn under shirts or blouses must be white or beige. Jumpers and skirts must be knee length. 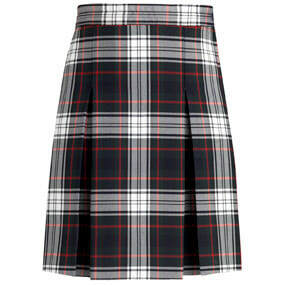 Skirts may not be worn above the knee or rolled up at the waist. 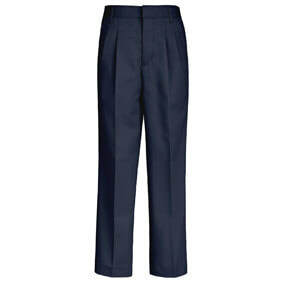 Dark, navy blue dress pants. Dark, navy blue shorts may be worn from August to September and from May to June. Cargo pockets or flare bottoms pants or shorts may not be worn. Socks must be white, black, or navy with NO LOGO. Socks must be able to be seen over the top of the shoes. If tights are worn, they must be white, black, or navy. Solid black, navy blue, or brown belts must be worn with pants or shorts that have belt loops. Any hair accessory that complements the uniform may be worn, assuming it does not interfere with classroom instruction. Red (k-4) or blue (5-8) St. Peter sweatshirts must be purchased from Dennis Uniforms or Lands’ End, spirit wear sweatshirts only permitted on announced spirit wear days). Sweatshirts must be sized appropriately and may not be worn tied around the waist. 8th grade only may wear the red hoodies as part of the uniform. Solid navy (5-8) or red (K-4) cardigan sweater. Solid navy or red (same grades as above) sleeveless pullover sweater vest (crew, or V-neck). Plain leather solid black, dark brown or dark navy blue shoes are worn. NO decorative stripes or plaid fabrics are allowed. Sperry shoes must also have black or brown soles, no white soles. Gym shoes are not allowed for uniform shoes. If a doctor note is needed the gym shoes must be black. High top gym shoes, cowboy/work boots, sandals, clogs, moccasins, open-toe, or open-heeled shoes are not allowed. No Sketcher shoes even if they resemble a uniform shoe are allowed. If a student must wear shoes that do not meet these requirements for health reasons, a note must be on file in the office from a doctor, (i.e., podiatrist, family physician, physical therapist, etc.). When in doubt, check with the school office/send a picture before removing tags and wearing shoes. Jewelry worn in school must be minimal, with the exception of religious medals. Dangling earrings are not allowed. Caps, hats, or tattoos may not be worn in school. Hair should be natural and neatly trimmed, free of dyes, bleach or extensions. Make-up is not necessary and only permitted lightly in grade 8. Blue cotton dress shirt with collar. T-shirts worn under shirts must be white. Socks must be white, black or navy with NO LOGO. Solid black, navy blue or brown leather belt must be worn with pants or shorts that have belt loops. Red (K-4) or blue (5-8) St. Peter sweatshirts. (Must be purchased from Dennis Uniforms or Lands’ End, spirit wear sweatshirts only on announced spirit wear days). Plain leather solid black, dark brown or dark navy blue shoes. NO decorative stripes or plaid fabrics are allowed. Sperry shoes must also have black or brown soles, no white or ivory. Gym shoes are not allowed for uniform shoes. Sketcher shoes are not allowed. High top gym shoes, cowboy/work boots, sandals, clogs, moccasins, open-toe or open-heeled shoes are not allowed. If a student must wear shoes that do not meet these requirements for health reasons, a note must be on file in the office from a doctor and then gym shoes must be black (i.e., podiatrist, family physician, physical therapist, etc.). Earrings, caps, hats, or tattoos may not be worn in school. Hair should be natural and neatly trimmed above the ears and above the collar, free of dyes or bleach.